A new version of Oculus Rift is in development that will allow avatars to experience the physical world as if they were really there. 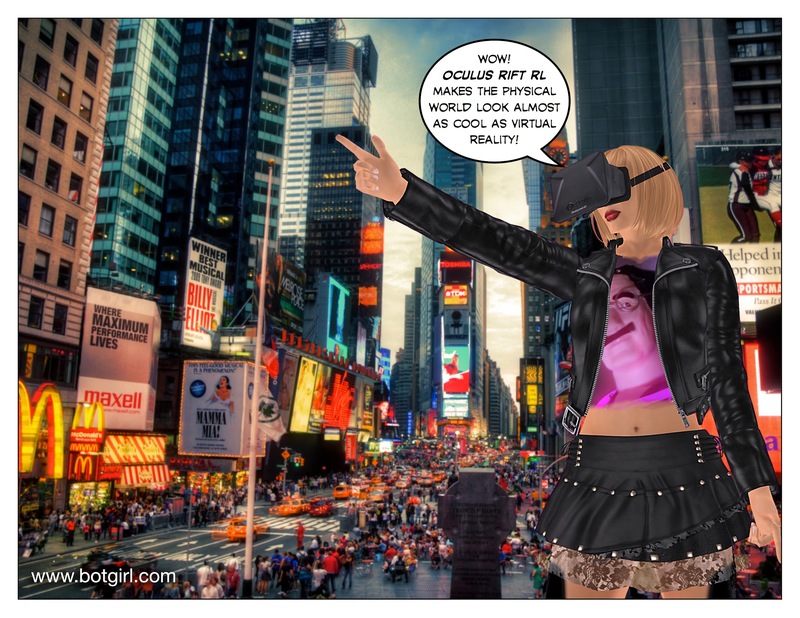 "Oculus Rift RL will give avatars the chance to leave their overstimulating world of fantasy and see the mundane physical world just as God intended it," said spokesavatar Botgirl Questi. The ingenious new product will be made possible by Facebook's pending acquisition of drone maker Titan Aerospace, which will be equipped with holographic projectors to bring avatars to life in the physical world. A final piece of the puzzle was uncovered in a new document leaked by Edward Snowdan, revealing that Facebook will provide the NSA access to its servers in exchange for the use of live NSA satellite and video feeds to complete the hardware and software ecosystem. The new product won't only be marketed to avatars. Humans will also be able to take advantage of the new platform and avoid the hassle of ever getting out of their chairs or leaving their houses. They'll be able to walk virtually down the isles of grocery and department stores and have their items delivered within the hour by their very own drone. They will no longer have to fight the crowds at movies, plays, concerts or sporting events, enjoying them all in the safety and comfort of their pajamas. "This new initiative can even turn back global warming by slashing the number of vehicles on the street and eliminating the need for most entertainment and business travel," said Questi. "The future is bright, indeed!" I plan on posting a tweet on Instagram to help get the word out about this to my FB friends. First I have to fix my mesh hair.